Fight Products is pleased to offer kids boxing equipment at discount prices. It is a great idea to start your kids out early in boxing or the martial arts. Kids boxing gloves are probably the first piece of boxing equipment you should consider. Does your kid have someone to box with? Why not get two pairs of kids boxing gloves so they can box with a friend, or an adult pair of boxing gloves from our boxing gloves page so that you can box with them. Next we would suggest kids headgear, we have the best prices on kids and adults headgear around so don't forget to get an adult headgear for yourself from our headgear page. Another great piece of kids boxing equipment to have is a heavy bag or punching bag. Our punching bags come unfilled to save you money both from the actual product and on the shipping cost. You can view our heavy bags and read the filling instructions on our heavy bags page. * The ages listed below are to be used as a rough guide. It really depends how big your kids hands are. Our new Leather Children's Training Gloves. These gloves have Velcro wrist straps and are 6 ounces. * They are for kids 3-7 years old. Our new Leather Little Kids Training Gloves. These gloves have Velcro wrist straps and are 8 ounces. * They are for kids 8-12 years old. Our new Leather Kids Boxing Gloves. These gloves have Velcro wrist straps and are 10 ounces . * They are for kids ages 12 and up. Our new Leather Children's Gloves. These gloves have Velcro wrist straps and are 6 ounces. * They are for kids 3-7 years old. Extra thick padding. Leather Little Kids Gloves. These gloves have Velcro wrist straps and are 8 ounces. * They are for kids 8-12 years old. Thick padding. Check out our full line of focus mitts. Focus mitts are a great training accessory for kids. Black Vinyl unfilled 40 inch punching bag. These bags come with a chain and swivel. They are unfilled and do not come with filling. See our filling instructions page. Kids vinyl headgear. This headgear is made of vinyl and has laces in the back. Kids Giant inflatable Boxing Gloves. 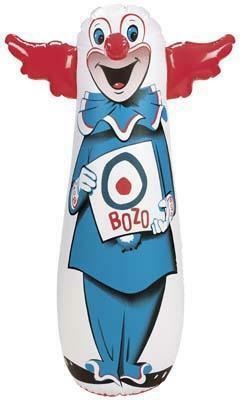 Check out our Inflatable punching bags on our Bop Bags page. We have lots of new kids equipment on our children's martial arts page. copyright 2005-2007 - The images of kids boxing equipment and content restricted.